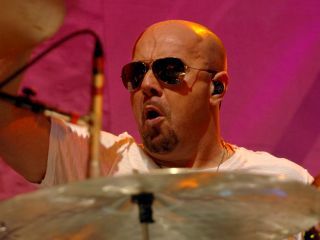 For Jason Bonham, son of the late Led Zeppelin drummer John Bonham, the term 'supergroup' seems to follow him around like a lost puppy looking for a home. "I don't mind," the 43-year-old sticksman says. "If the word gets people's attention, that's fine. Believe me, there's worse things you could call a group than 'super.'" Bonham is a member of one outfit that has recently had the the supergroup tag bestowed upon them: Black Country Communion, which also includes blues-rock guitarist and singer Joe Bonamassa, former Deep Purple bassist and vocalist Glenn Hughes and ex-Dream Theater keyboardist Derek Sherinian. After a series of legal wranglings concerning their name (another musician claimed ownership of the Black Country moniker, resulting in a last-minute Communion addendum), the band will issue their debut album in September. Still, that most super of supergroups continues to occupy Bonham's time: Led Zeppelin. Following the triumphant December 2007 Zeppelin reunion concert to honor Atlantic Records founder Ahmet Ertegun, rumors quickly spread that the behemoth band would mount a full-scale - and no doubt, record-shattering - world tour. Singer Robert Plant, then enjoying what would be a Grammy Award-winning collaboration with bluegrass artist Alison Krauss, seemed ambivalent about hitting the road with Zep again. When pressed by Jimmy Page and John Paul Jones for a commitment, Plant begged off, and the search was on for a replacement singer. Bonham confirms that, throughout much of 2008, he, Page, Jones and various vocalists wrote and jammed for what they hoped would be the return of Led Zeppelin. "It got real close," he says. "It got as close as you can possibly get." For reasons that Bonham doesn't fully explain (although he alludes to a disagreement between Page and Jones), the eagerly anticipated tour imploded. But that's not stopping the drummer from celebrating the music of Zeppelin and, in the process, paying tribute to his late father. In October, he'll embark on what he's tentatively calling Jason Bonham's Led Zeppelin Experience, a multimedia event that will tell the story of the famed band from his perspective. In the following interview, Jason Bonham details his plans for the upcoming tour, and talks about the reunion that wasn't. I know you've tinkered with the name of this tour a bit. So can we finally call it Jason Bonham's Led Zeppelin Experience? "Yes, that's the working title. The name works on a few levels, because it basically tells people what it is, that it's about Led Zeppelin, the band. But it's also about my life, as well. It's going to be quite a multimedia spectacle, with film clips and photographs, great lights and sound." I understand you've been approached to do something along these lines before. "You know, since we did the Zeppelin performance at the O2 in 2007, a lot of people have asked me if I'd go out and do something in this way. To be honest, and this might sound surprising, but it's something I've kind of shied away from. "But then I thought, I'll do something really spectacular and different. I'll take this somewhere else artistically. Plus, it'll be 30 years since my father passed away, so I said, 'Right, I'll do 30 shows, have some fun, play some great Led Zeppelin music. I'll surround myself with a bunch of great players, a terrific singer - it'll be fantastic.'" "The whole concept started to grow in scope. I thought, I can do some of the songs in slightly new ways, have some different instrumentation, things like that. I'm still putting it together, but I'm very excited. The visual level is going to be quite incredible." How so? What kinds of things are you planning? "There's going to be a storytelling aspect to the show - I guess you could call it half-concert and half-story, really. To achieve this effect, we're going to have huge screens showing old footage of my dad when he was young, as a kid, footage of me playing with him, along with some film of me when I was growing up. Musically, we'll cover all the periods of Led Zeppelin, so fans will definitely get their money's worth there." Now, when you say 'storytelling,' are you going to be talking to the audience in an anecdotal manner? "There will be a prerecorded narration throughout the show during the changing or the sets and various things that will be happening. That's what's so exciting about this: it's going to be two hours of Zeppelin and my father, presented in a very theatrical way." Do you have a singer picked out already? "I have everybody picked out, all the musicians, and they're going to remain nameless until opening night." "That's right. [laughs] I don't want anybody to have a prejudged idea about the show going in, so I'm keeping those kinds of elements to myself. I don't want anybody going on about how 'this person's done this and that' and 'who's this person and what have they done?' Nothing like that. On the opening night, the audience will sit down and that'll be the first time they see the people up on stage in that environment." I don't know if you'll be able to keep everything under wraps until October, but good luck with that. "Yeah, thanks. I'll need it! [laughs] So much of this is going to be hard to keep a secret, like the setlist." Well, I won't ask you to reveal your setlist, but let me ask you this: Do you have a favorite Zeppelin song to play? Also, is there one that has always given you problems, one you feel you haven't quite mastered? "Oh, they all give me problems! [laughs] But I would say my favorite Zeppelin song to play is Kashmir. I have a great time playing that one. The hardest one, the song that I always find difficult to do properly, is definitely Rock And Roll." "Because it's a two-hand shuffle all the way through. It's not single strokes. If you listen to it, it's not like 'boom-bap-boom-bap!' It's more like 'boom-boom-bap-bap-boom-boom-bap-bap!' on the snare and hi-hat. To do the song correctly, your left hand is buzzin' the entire time. You hear a lot of people play it and you go, 'That doesn't sound quite right.' Because they're just going 'boom-bap-boom-bap!' - very straight. To do it right, you have to add the grace notes on the snare. I'll be honest: the intro I can get right, but the rest of it still gives me problems to this day." Well, you sure fooled me. For the Led Zeppelin Experience, or any of the one-off concerts you've done with the band, how do you prepare? Do you go through the albums and study your dad's style, or do you go deeper and check out film clips and bootleg recordings? "Oh, I definitely study. For the O2 show, especially, I really prepared. I went through a lot of shows the band did and sort of analyzed what my father was playing and how the rest of the group played as well. Different eras, different tours - I'd pick and choose and go, 'Well, I like what he did here on this tour, and on that tour I like what he did there.' Yeah, a lot of work goes into it. And for the show I'm putting together now, I'm doing the same thing." "That said, because it's called Jason Bonham's Led Zeppelin Experience, I'm going to change around pieces here and there and do some things my own way. I think people will like it. If it's fun and exciting for the person who's playing it, chances are the audience will pick up on that and feel the same way." Being that you're a drummer, is it more of a blessing or a curse to be the son of such an iconic drummer? Have you ever talked to, say, Zakk Starkey about your situations? "I've talked to Zakk, yes. The big difference between us, of course, is that my father passed away and his is still alive. We have two totally different perspectives. "It's interesting. I think to myself, How would things be for me if my dad was still alive? Would we get along? Would we argue? You know, we never got to the falling-out stage with each other. He'll always be my dad, but we never experienced a lot of those things that go on as you get older. "As far as being a drummer, to me it's a positive that he's my father. To be mentioned alongside him…I mean, you Google his name and mine comes up, too - wow! [laughs] Not too shabby." When you, Jimmy Page and John Paul Jones were trying out various singers like Myles Kennedy in 2008, how close were you to actually putting Zeppelin on the road again? "It got as close as you could get. It got real close. You know, we did a year of writing and putting stuff together. I loved working with Jimmy and John Paul. It was so much fun. That band…I think we felt more like a band than Black Country Communion." So what happened? If you were getting along so well, why did it not come to be? "I think…basically, they agreed to disagree. After a while, it was just time to move on." And by 'they,' you mean Jimmy and John Paul Jones? But things were fine with Myles Kennedy. He was all set to go, right? [surprised] No? Wait a minute. I thought he was the guy. "Nope. There was somebody else. [pauses] Somebody else was involved - and that's all I'll say to that. But as I said, I've always love the time we had together. I can't even explain it, it was just great!"